Oct. 20, the 23rd day of the pro-democracy movement Occupy Central, was also the graduation ceremony of the Lingnan University in Hong Kong. 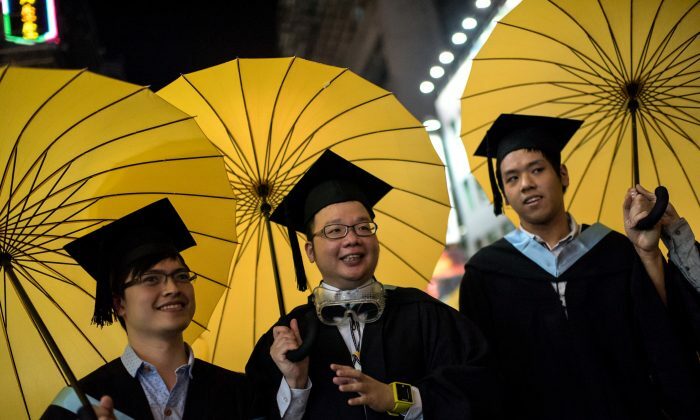 Students held umbrellas at their graduation to express their appeal for universal suffrage. The head of Lingnan University, Leonard Cheng Kwok Hon, hosted the talks between Hong Kong chief executive Leung Chun-ying and the protesting student leaders, scheduled for the evening of Oct. 21. Principle Cheng is known as a supporter of Leung Chun-ying. Dozens of students at the graduation ceremony hosted umbrellas and banners, hoping Cheng would host the talks fairly on Tuesday. Before the graduation ceremony started, a group of students distributed yellow ribbons representing universal suffrage to students and teachers outside of the hall. A student put a yellow ribbon on the chest of principle Cheng Kwok Hon. Cheng didn’t take it off, and kept it on during the ceremony. Cheng indicated that he respects people’s freedom to express different opinions. When China’s national anthem was played at the beginning of the graduation ceremony of Lingnan University, a number of students opened umbrellas and some held up banners to support the pro-democracy movement for full universal suffrage, according to the footage of Hong Kong media Now TV. Some students walked onto the stage with opening umbrellas to receive their degree and honor, and yelled “Go, Hong Kong” to express their support. At a press conference on Monday, Cheng vowed to the media in Hong Kong that he would host the talks in a fair and impartial manner. Another dialogue, another opportunity lost for democratic reform in Hong Kong.